WWE Superstar Dean Ambrose will team with Roman Reigns and Universal Champion Seth Rollins this Sunday for WWE’s special event, The Shield’s Last Chapter. This event will not only be The Shield’s last match, but will probably be the last televised performance of Ambrose before his contract expires. News of Ambrose's decision to leave WWE emerged in January and were eventually confirmed by the company after he turned down a five-year contract. The reason for his departure was due to creative frustration. The Shield’s last match took place at WWE Fastlane when Ambrose, Rollins and Reigns defeated Baron Corbin, Bobby Lashley and Drew McIntyre in the main event. Ambrose, Rollins and Reigns would disband the group on the Raw after Fastlane and was believed to be their last time wrestling together. 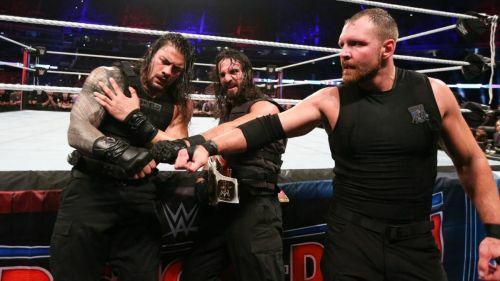 The Shield's reunion was not expected to occur due to the fact that Ambrose turned heel the night after Roman Reigns announced his ongoing battle with leukemia. Rollins and Ambrose would continue to fight heading into 2019 after The Lunatic Fringe said horrible things about Reigns and his battle with cancer. This storyline was dropped as soon as Reigns returned to TV and announced that his cancer was in remission. He was greeted by Rollins the following week when the two agreed to reunite The Shield at the request of Reigns. With the group disbanding after the Fastlane pay-per-view, this will be The Shield's fourth reunion since the group broke up in 2014 for the first time. The Shield had another goodbye moment last week after Raw went off the air, leading many to believe that the faction was done for good until the announcement earlier today by WWE. The Shield's last opponents have not been announced, though they are advertising an appearance by Intercontinental Champion Finn Balor at the event.